We’re fast approaching a critical date for the rollout of the Affordable Care Act, as health insurance exchanges are due to open for new participants on October 1. The forecast for whether the new law will succeed largely depends on your home state. Some are highly organized, with exchanges ready to roll. Others are falling back on the federal government for coordination and are stumbling toward the starting gate. What does this all mean for you? There is no consensus yet on whether health insurance customers will actually save money. It depends upon competition within the states, whether you qualify for a subsidy and what level of coverage is chosen. Early indications are that the most organized states with robust competition will be able to offer some relatively low premiums. According to a recent study by the Kaiser Family Foundation, only 17 states and the District of Columbia have published policy premium rates. So the jury is out on more than half of the country. 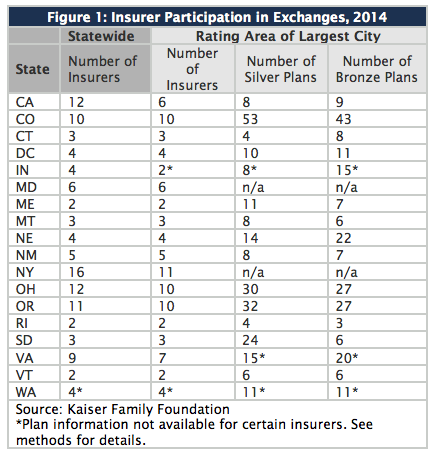 The states with the greatest numbers of insurers participating in the exchanges are California (12), Colorado (10), New York (16), Ohio (12), and Oregon (11). Insurers participating in the exchanges will offer more than one plan ranging from catastrophic (high deductible), bronze, silver, gold and platinum. The premiums rise as you ascend the relative value of the metal, with bronze being the cheapest. Premiums vary widely. The lowest-cost bronze plan starts at $146 a month for a 40-year-old man in Baltimore to $336 in Burlington, Vermont. Net premiums will depend upon whether the purchaser qualifies for subsidies, which vary depending upon the size of the family and income level. The income range to qualify starts at $28,725 for individuals to $99,075 for a family of eight, according to healthcare.gov, the federal government's website. The subsidies also depend upon the plan chosen. For example, a 40-year-old New York male would pay $193 in the lowest-cost silver plan (priced at almost $400 before the subsidy) and $111 in a bronze plan. The average annual subsidy – for those who qualify – will be about $5,300. Pricing the plans – and choosing the right one – will be complicated, though. The silver plan with the second-lowest cost is the benchmark for figuring the subsidies, which are paid in the form of income-tax credits. These tax breaks are calculated by setting a cap on "the percent of the enrollee's income that he or she would need to spend on the second-lowest cost silver plan available." The government has defined the caps, so doing the math shouldn't be too involved. Nevertheless, negotiating the array of plans with varying subsidy levels is going to be difficult for some. For example, a family of four with household income of $60,000 will pay $683 initially for a second-lowest cost silver plan in Maryland. Although their income is 255 percent above the federal poverty level, they still qualify for a $273 tax credit. That makes their "net" premium $409. If they were to choose the even-cheaper bronze plan, their net cost is $164. Although the subsidies provide an effective after-purchase discount to reduce the overall cost of premiums, they only cover those whose incomes qualify. For those falling under the poverty-income thresholds, participants may be able to qualify for Medicaid – provided that their state has adjusted their Medicaid program to accommodate them (many haven't, see below). In Minnesota, for example, where 1 million residents are expected to use the marketplace to buy more than 140 offered plans, a family of four earning $31,000 annually will qualify for free Medicaid coverage. While most of the largest coastal states seem to have their act together on their exchange rollouts, others – particularly in the south and Great Plains – are struggling to get their exchanges up by the end of the month. There's also going to be a coverage gap since several states have not expanded their Medicaid programs as a result of the Supreme Court ruling that upheld the Affordable Care Act but left Medicaid expansion up to the states. According to the Congressional Budget Office, today there are some 55 million non-elderly Americans without health insurance. That number is expected to drop to 37 million by 2015, but 31 million will be left uninsured thereafter. Those falling into the coverage gap are "undocumented workers and poor people living in the 21 states, such as Virginia, that have so far declined to expand Medicaid under the statute," according to The Washington Post. For example, the Kaiser Foundation predicted that the uninsured rate in Arlington County, Virginia, would fall from 12.4 percent to 7.4 percent after the ACA is fully implemented in 2022, but that that 14,000 people would still remain uninsured, down from the 24,000 people currently lacking coverage, according to the Post. What happens to those who can't afford to buy private insurance but can't qualify for Medicaid under state guidelines? They will still be underserved by the current system and put pressure on hospitals and clinics for charity care. For that to change, either state legislatures will have to revise their income qualifications – and accept federal aid to cover the additional recipients – or the Affordable Care Act will need to be expanded. Neither of those scenarios seems likely given the current political climate.